Last month I finished up a project for one of my favorite places in Hungary, Catherine's Cottages located in Csákberény. I was asked to design the logo and promotional postcard. I was so happy Catherine thought of me. Her cottages give me so much inspiration! Below are the final results. 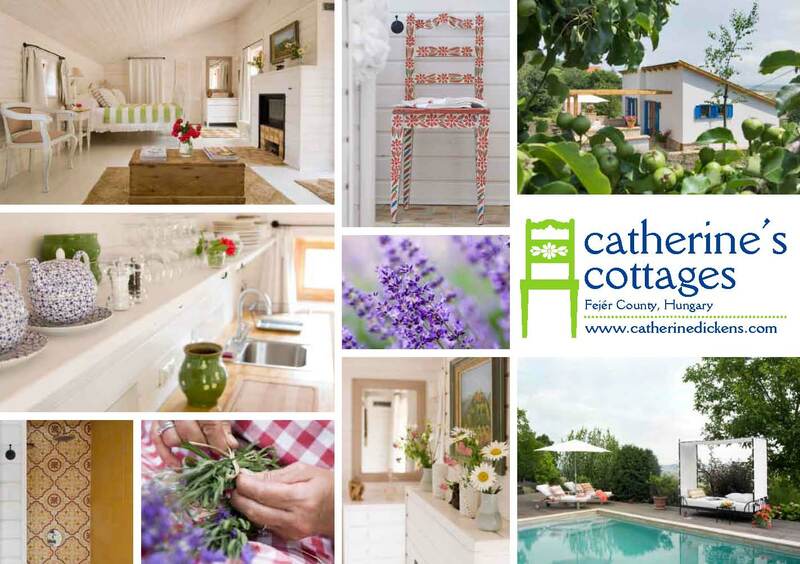 If your interested in renting one of Catherine's adorable cottages click here. While in Beaucaire, my friend took me to a darling little shop mixed with new and vintage home and gift items. I found these three postcards and fell in love with them. 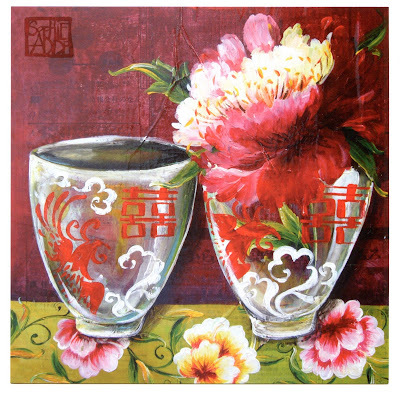 The artist is Sophie Adde. 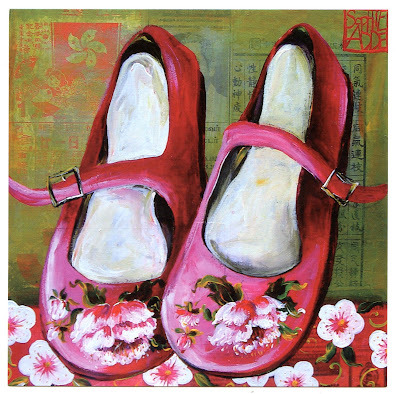 I like her use of color, the way she works the paint and how she incorporates pattern. I also think it is very clever the paper that peaks through the background. I have plans of framing these three postcards and hanging them all together somewhere in our flat. I have discussed in this blog before how I love collage art. I guess that is what you call it...layers of images mixed with vintage fabrics and wallpapers. In the next few posts I will share a few items I picked up while traveling that are indications of this deep attraction I have. A vintage Estonian postcard 1926 I can see Anahata Katkin being inspired by the two people in this postcard. I was not working while on holiday....well, maybe just a little. But I was inspired and I really enjoyed myself. Before I left for vacation my NY rep told me to cherish the time off and to not work. He said me and my work needed a break. I kept thinking about this and I think he was right. I did do a bit of painting while I was away but it was fun...it didn't feel like "work". Now I am back in Budapest and as I sit here surrounded by my thoughts of everything I saw and experienced. My creative juices are flowing. I bought a few small things while in France and Estonia. When I lay out all my purchases, it is so obvious that even though I was not "working" my creative mind was never asleep. I love the purples and teal with lime green and hints of pink. I am excited to seem where this goes. The background fabric I bought at flea market in France-Liberty fabric. 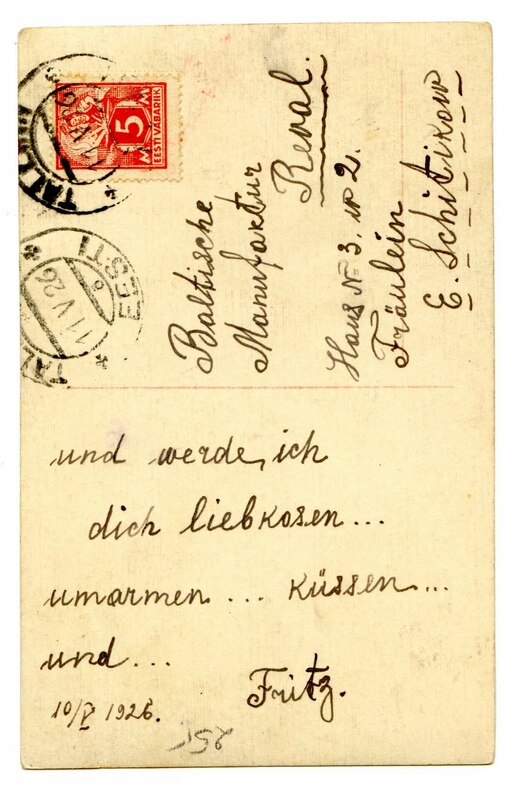 The two postcards are Estonian circa 1926. The glass bottle is from Beaucaire from an olive oil coop. The two fabrics at the bottom are from a skirt I bought at a market in Tarascon. I don't know what to call this one? Any ideas?? I love the reds mixed with the pea greens. The tin on the left is from Estonia. 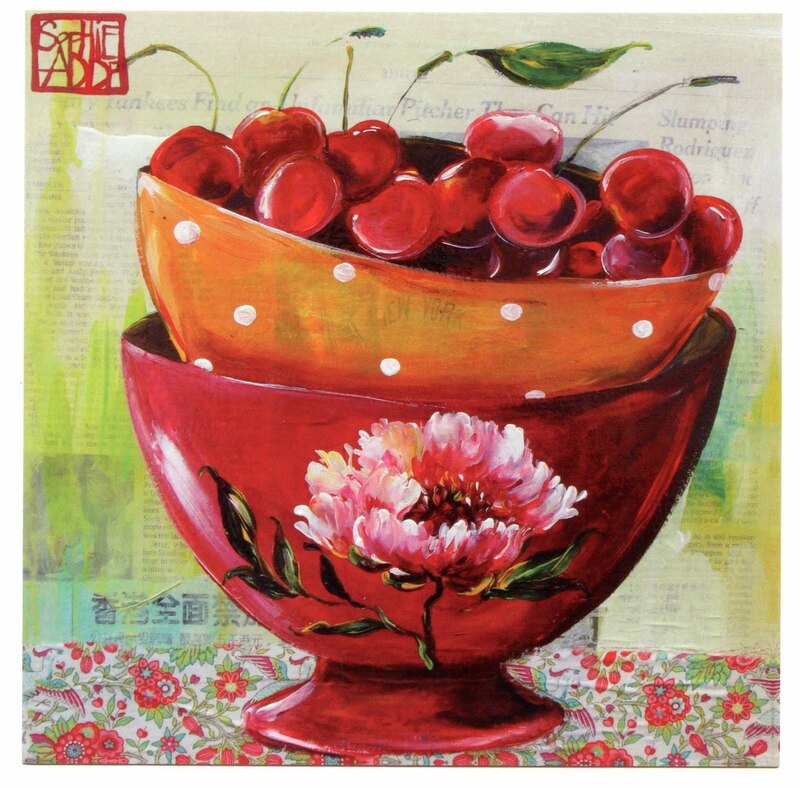 The card on the right is by French artist Sophie Adde. They look like they were created to go together don't they? A quick follow up to yesterdays post. On my way out of the Souleiado store I grabbed a catalog for the current collection. Here are a few of favorite prints. I am back! After almost 4 weeks of travels in France and Estonia, I am back with new ideas and tons of inspiration! I took loads of photos and have been trying to decide how to tell you about everything in a way that seems organized. Today I start with Souleiado, a textile company & museum in Tarascon, France. The history of Souleiado is quit fascinating. I found a great website that explains the history of the company. click here for the website. Thank you to my dear friend Antoinette for introducing me to this French tradition. I love the colors in the below pattern very Provence! I loved that they had rooms set up as workshops. love love love the colors!!! Antoinette and I enjoying a cold water outside the museum. It was so hot in France that our days were filled with cold drinks and many showers. The museum was next door to a Souleiado store. I fell in love with these shoes. They were not the most comfortable and so I didn't buy them...but aren't they adorable! If you want to see more photos from Souleiado, see my flicker page link on the right.